~Camellias are the ‘Rose of Winter’ in southern gardens, with their colorful blossoms held against deep rich green glossy foliage on a naturally upright evergreen shrub. The Camellia japonica’s bloom season is typically from mid- winter through spring making it easier to differentiate themselves from their close fall blooming cousin the Camellia Sassanqua. Although the Camellia japonica grows rather slow, they are still highly prized for their place in the landscape and typically reach 6-12 feet at maturity. The large blooms come in an array of shapes and colors. They prefer well-drained soil rich in organic material and shade from the hot afternoon sun. 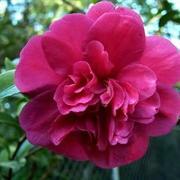 There are more than 3,000 named cultivars registered with the American Camellia Society. Some more popular varieties found in our area include Purple Dawn, Professor Sergeant, Debutant, and Kramer’s Supreme. ~The Camellia Sassanqua tend to have slightly smaller leaves and flowers than the Camellia japonica giving them a less formal appearance. Their flowers range in color from white to pink to red and may be single, semi double or fully double, and are usually very profuse bloomers. The Sassanqua vary in sizes as well ranging from 2 to 8 ft. and even larger in the southern region of our state. Cotton Candy is a reliable dense, upright variety growing 6 feet, that bears fully double clear pink blooms and is often one of the first Fall blooming Sassanquas to flower. Yuletide is an upright as well, but with a much slower growth habit. Single crimson red blooms with a large golden yellow stamen are borne around Thanksgiving and Christmas. ShiShi Gashira, has been one of the most widely planted in the south for many years. Its reliable performance in Louisiana landscapes made it a sure winner for a Louisiana Super Plant.